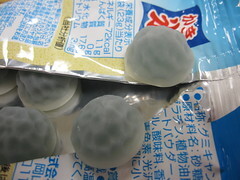 Kabaya isn't the biggest name in the Japanese snack business, but they do make excellent gummies. These are based on kakigori, a popular Japanese summer treat that is basically a snow cone. These came in four flavors: Soda, Melon, Lemon, and Strawberry Milk. They were even shaped like little mounds of shaved ice! Soda smelled strongly of ramune. The texture was really neat! The coating and bottom half was a little crunchy and grainy (sort of like ice) but the top of the inside was soft, sticky, and gooey. It had just a hint of a fizz to it and a good citrus flavor. Melon smelled a little floral, and the flavor was a very convincing, mellow honeydew. It had the same interesting shaved ice-like texture, and I had no complaints. Lemon smelled like a cleaner, and although it tasted a little more like a lemon than it smelled, it still wasn't too authentic. It was floral and sweet, but my least favorite of the flavors. 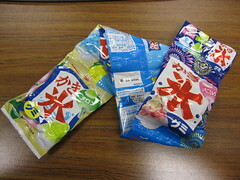 Although the textures were similar, the flavor was not as good as the other Kabaya lemon gummies I tried. Strawberry Milk was very authentic! It smelled and tasted just like strawberries and condensed milk. It was one of the sweetest of the bunch, but the favor was so good that I didn't mind. Me too! These gummies were really good, except for lemon. I thin it's still worth it though!